It has been an amazing week over here since we just got back from some fun in the sun in Cancun! Adam and I love going to the beach. It's especially easy to jet down to Mexico since it's only a two hour flight away. Every time we go on a beach vacay, we never stay at the same place twice. We love trying new, different places and seeing all they have to offer. This trip, we decided to go Cancun, and actually stay in the city. Usually when we fly into Cancun, we drive to Maroma, Playa Mujeres, and other places. Since this was a quicker trip, we wanted to make the most out of our vacation, so it made sense to stay "in the heart of it." After perusing TripAdvisor, Google, and Yelp, we decided to stay at The Ritz-Carlton Cancun. 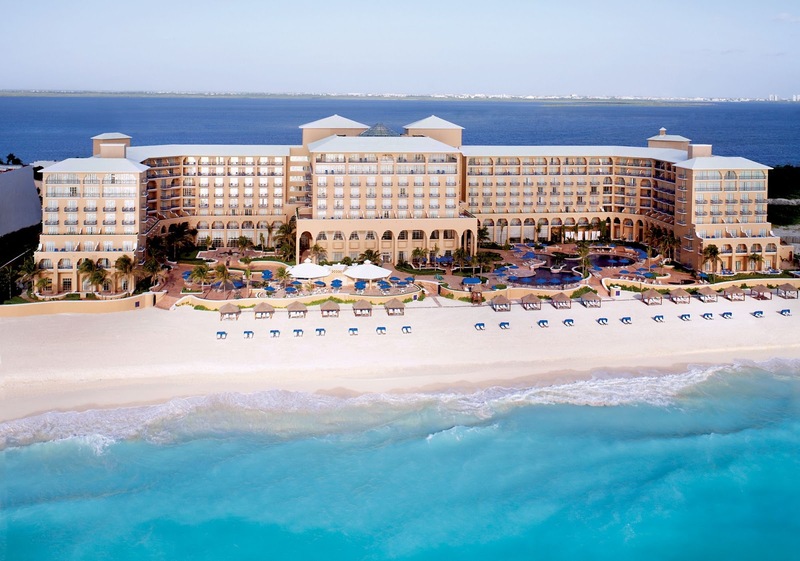 The Ritz is a quick 20 minute drive from the airport, and just celebrated 25 years in Cancun. I have long been a fan of the Ritz-Carlton brand, having grown up staying at their properties. What I love about the Ritz, is that their service, accommodations and amenities are truly a five star experience. We stayed in an Ocean Front room on the Club Level. As you can see from our pictures, the view from the room was stunning - seriously, I have no filters on any of these photos! The color of the water was that blue. The Club Level is on the 8th & 9th floors of the hotel, and offered continuous food service throughout the day. The food service included breakfast, lunch, mid-day snacks, hors d’oeuvres, and hand-crafted desserts. It also included soft drinks, water, fine wines, cocktails, and liquors. It was a really nice addition to our stay, and definitely provided the all-inclusive aspect we love on vacation. The food was delicious, and it was hard to resist their homemade chips, pico de gallo and guacamole. Yum! During our stay, we also enjoyed dining in their award winning Fantino Restaurant, and went to the Club Grill twice. The menus at both restaurants were amazing, although I was partial to the truffle burrata and filet mignon with foie gras butter. The service at both restaurants was beyond compare (as it was throughout the hotel), and they always made sure to add romantic, special touches. Since last month was our seven year "dating-anniversay" we were greeted with rose petals on the table, beautiful desserts, and a true fine-dining experience. Although there are a lot of fun activities to do while in Cancun, we opted to enjoy our time on the beach resting, relaxing, reading, and enjoying their yummy jalepeno margaritas. 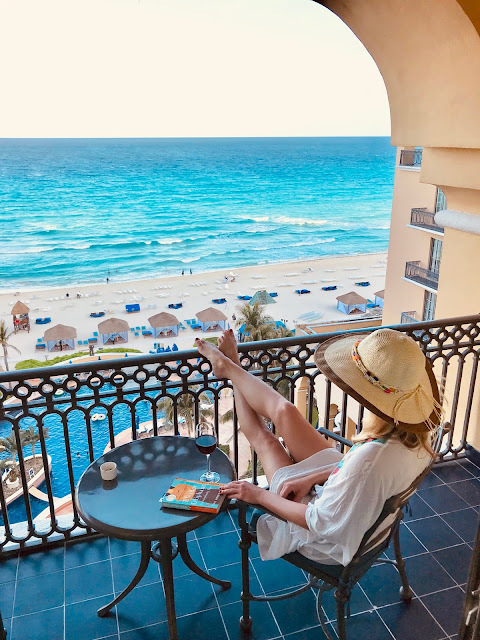 Since we've been to Mexico a lot, we've previously visited the Mayan ruins, ziplined, parasailed, and all the other fun stuff, so we definitely didn't feel guilty in indulging in our books. I read Eleanor Oliphant is Completely Fine, which was the perfect beach read. After five days at The Ritz-Carlton Cancun we've returned home sun-kissed and refreshed. I would definitely recommend staying at this property if you're headed to the Cancun area. From the gorgeous beach, to their pools, delicious restaurants, and friendly staff, you won't be disappointed. Thank you to The Ritz-Carlton Cancun for partnering with me on this post. As always, all thoughts and opinions are my own. Thank you for supporting the brands that make Ashley Nicole Style possible.